I have been so busy with my current photography project that I am afraid that I am neglecting you, and my blog too. But eh, it will not last, will it? So I promise to come back soon with an easy dessert, one that talks a lot to me, at any time of the day. How is it that I can click on “Dairy Products” and know I’m going to see something beautiful on your site? These make my mouth water . . .
Beautiful little jars, and what’s inside looks delicious, too. Looking forward to the easy dessert recipe! hooray! i can’t wait for a new recipe from you… good luck on your project! Those look great…can’t wait for the recipes. you know bea… you can just show us old photos too because I can never get enough of your photography!! These look amazing!! What a wonderful collection of pictures! I like a lot these photos ! I purchase Spega yogurt from Trader Joe’s that is packaged in these little glass containers. It is imported from Italy and is quite good. My favorite is mixed berries. Those look delicious. Wonderful picture. Where are the little jars from? I might need to get my hands on some. Lovely photos…I love the little glass or ceramic jars that desserts come in either in France or Italy…we are always amazed when we go shopping over there. Hope your project is going well and yes, you are missed! Je suis très curiuse de la recette! We do share the same brain some days…spooky…I have been making a lot of yoghurt and cheese and fromage blanc these days. Love how simple and satisfying these look. Lovely! I’m going to have to make a batch of yogurt tonight! all right, where did you get those jars – they are adorable. Bea, I NEED that chocolate thing. What is it? Beautiful little jars – I’m intrigued. Your photography is stunning. Your blog is so beautiful: a feast for the eyes. I have to agree with previous comments the content of these little beauties makes my mouth water– pots de creme? Bea, your site is amazing. The photographs are simply stunning. I hope you share this recipe. Beautiful and luscious. Will you post the recipe? Thank you! Beautiful and mouth-watering as always! 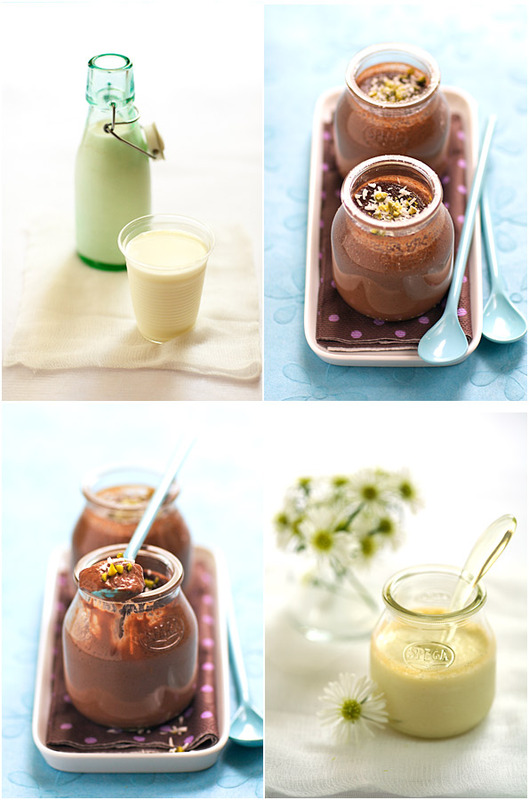 Homemade yogurt or petits pots de creme? Bea, again I am mesmerized by your photos, the colors, the composition, not to speak about the wonderful food. Could I ask you a question? Could you please share with me where you find all these beautiful spoons, I am wondering online for the last two days and you had no luck. I hope you don’t mind. I have tried quite a few of your recipes and they tasted absolutely wonderful. Pictures are soo gorgeous as well. I love the glass jars in this picture. Could you please let me know where I can buy them? I live in Sydney, Australia, the produce is as not as good as you get in New Zealand or Tasmania. Your pictures are divine, and I’m sitting here with my mouth watering big time after seeing those divine treats. That chocolatey moussey thingy really looks yummy to me. I’m tempted to rush off to go and purchase some chocolate mousse now. This blog is definitely not a place for dieters to frequent!